This is a curious problem of where a group of people have got something wrong and this perpetuates the error such that it is now to be found in a few books and a hundred or so internet sites. Worse, the error centres around the Jane Austen afficionados and societies of the world. Why I wonder do scholars and enthusiasts of Jane Austen manage to get this wrong? All the names are right except the two Philip Lybbe-Powyses. The little boy was Edward Cooper, her nephew, who in later life married Caroline Lybbe, daughter of Philip and Caroline Lybbe Powys of Fawley, near Henley. (Philip was brother to Reverend Thomas Powys and took the extra surname when he married the heiress Caroline Lybbe). It was only natural that Cassandra should have some misgivings at the momentous step she was about to take. Her first view of Mr Austen's Steventon parish had not greatly endeared the place to her. The landscape was low and undistinguished by any striking natural features; the rectory was mean and in a state of disrepair. But most of all she felt a lingering regret about severing her ties of affection with Tom Lybbe-Powys. The two of them had been friends since infancy, when they had played together at Hardwick Hall. or with the Cooper children at Phyllis Court. At last, the time had come for Tom to tell her that childhood friendship had matured into adult affection; but he had then no income to support a wife, nor any prospect of obtaining one. Whereas Mr Austen was the rector of one parish with the promise of another. She remembered the day, more than a year ago now, that had brought the news Tom's appointment as rector of' Fawley parish in Buckingham. I do not know where Nokes got the 'Lybbe-Powys' name from. Thomas Powys, the man himself, had been born with just that forename and just that surname and rose to some eminence and prosperity as Dean of Canterbury. In a similar situation was Mrs. Lybbe Powys. Mrs. Austen‘s sister Jane had married the Rev. Edward Cooper, and had a son Edward and a daughter Jane. The young Edward married Caroline, daughter of Mr. and Mrs. Lybbe Powys. The Austens visited the Coopers at Edward's parsonages at Harpsden and Hamstall Ridware in Staffordshire, Mr. and Mrs. Lybbe Powys spent their winters in Bath (in the winter of 1805-06, just around the corner from the Austens), and were on good social terms with the Leigh Perrots. Jane Austen had ample opportunity to know Mrs. Lybbe Powys well. This really holds the key to problem, she refers to the family as 'Lybbe Powys' which happens to be wrong. The cause is alsmost certainly in the book of eighteenth century life "The Diaries of Mrs Philip Lybbe Powys" written by Caroline Powys, née Girle and edited by Emily Climenson and published in 1899. This book got the naming right, particularly in its title. But they used a style which is now out of date and not understood by modern readers. It used to be customary in the 19th century to refer to a married woman by the name of her husband. The husband in this case was Philip Lybbe Powys, so that is how his wife was styled. But he was a somewhat early example of a chap with two forenames, Philip and Lybbe, the latter in honour of his mother the heiress. Modern readers have thought that the Lybbe was part of the surname and written accoringly - and got it wrong. You can see in both of these that the surname is given, misspelt unfortunately, as POWIS on its own. I can't see a 'Lybbe' in there anywhere. 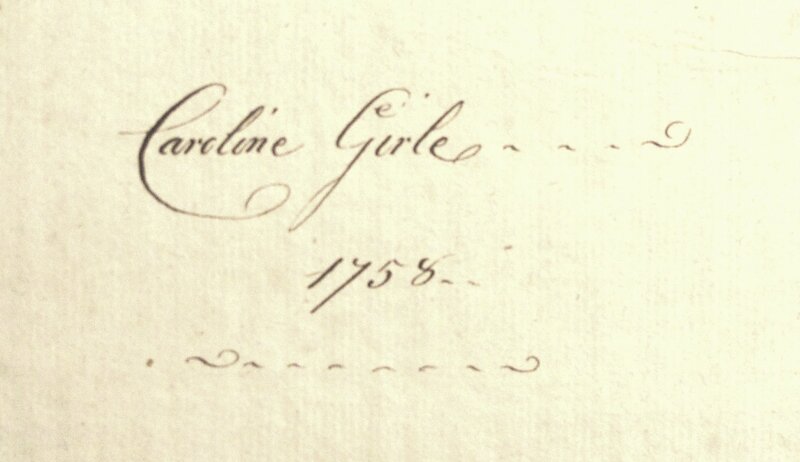 I am a direct male descendant of Caroline and Philip but my surname has changed. This was a long and complicated process taking nearly 50 years to complete and it started in 1863. My great-great- grandfather, one Philip Lybbe Powys where Powys was his surname (his father, to underline my explanation above, was Henry Philip Powys with no Lybbe in his name at all), went through a hiatus and separated from his wife. He set up house with another lady and, unable to divorce, came up with the strategem of changing his name by getting a royal licence to add Lybbe after Powys. Having done that, he and his lady made themselves known for the rest of their lives as Mr and Mrs Lybbe and their three daughters were the Misses Lybbe.